Learn how to integrate Master Data Management (MDM) and SAP R/3 using SAP PI in short frame with SAP NetWeaver as the framework in this tip authored by Bala Subbaiah Gorla of SDN. Inbound and outbound scenarios are presented. This blog will show you how to integrate Master Data Management (MDM) and SAP R/3 using SAP PI in short frame with SAP NetWeaver as the framework. MDM and R/3 integration is required in two different scenarios as listed below. We will be discussing the inbound process i.e., inbound to the SAP R/3 and outbound to the SAP MDM. (Example Repository, BP3_PoC_Customer) -->Admin -->Client Systems. This right hand side you can find Client Systems context area. If you right click on context area, you will get the context menu Items, choose --> Add Client System, enter name of a client system (example, Siebel), code and type. See the below figure 2. Select --> Ports --> by navigating MDM Console -->Repository (BP3_PoC_Customer) --> Admin --> Ports. By clicking on the Ports you will get Context Area in the right side. Right click on the Context Area and you will get Context Menu. From selections choose the Menu Item -->Add port. Here you need to give TWO ports details, one is for Outbound, and other one is for Inbound. In this step we need Outbound Port. The Port Name is SIEBEL_OB_CUS_SIEBELCUS01, Code SIEBEL_OB_CUS_SIEBELCUS01, and Type as Outbound. See the figure 3 below. In the SAP MDM Server-->Look at the server folder structure for the repository. Here, you can see the Client system and Outbound Port details as folder name in the SAP MDM Server folder, which creats in MDM console as shown in below figure 4. NOTE: No customizing is required in MDM Server but you need to ensure whether the folders as explained here are created in the inbound and outbound folders after additions of the ports in console. Configure/Specify the file folder path for pulling the file in FTP Server.This is screen refers the FTP server configuration (WS_FTP server). >>>Here, I will be discussing about inbound process, the above figure shows the entire process. 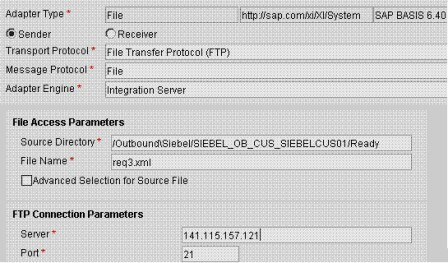 Process step in PI: Here you need to need specify the File Communication Channel Path as folder specified/created as in the MDM sever (i.e.,Outbound-->Siebel--> SIEBEL_OB_CUS_SIEBELCUS01 -->Ready) as per FTP Server configuration. The File Adapter picks up the file and then PI process starts. In the PI transformation and conversion happens and then sends the IDoc to the R/3Inbound port. Process step in R/3: Here the IDoc receives to Inbound port and then IDoc is available in R/3. I hope this blog will be useful for real time while integrating the same. Want to read more from this author? Click here to read Bala Subbaiah Gorla's weblog. Click here to read more about Master Data Management (MDM) on SDN.